With top teams from across the Atlantic Coast coming to Chapel Hill this weekend, Kickoff is set to be an almost-too-early look at where the top squads in the region currently stand. A small contingent of Southeast and D-III squads rounds out the crop of teams all looking to jumpstart their seasons and start chasing after bids. Unlike last year’s round robin play, Kickoff will feature a bracket with the top two teams in each four-team pool advancing to quarterfinals on Saturday afternoon. #1 North Carolina Darkside has always used kickoff to get reps across their roster and test out offenses that they’ll implement later in the spring. It’s been a long time since they’ve faced an opponent capable of pushing them to run tighter rotations of players so early in the season. It would not be surprising to see UNC rest starters until the bracket as they have in past years — or sit them entirely, depending on their health. A lot of the heavy lifting this weekend will fall on the shoulders of their depth, though that really isn’t too much of a worry for a team this deep. When Matt Gouchoe-Hanas, Liam Searles-Bohs, Elijah Long, and Walker Matthews sat during fall tournaments,1 the offensive load fell on the shoulders of Kai Marcus and Anders Juengst. Juengst, in particular, has developed into a very quick and steady player with plenty of athleticism on hand. Meanwhile, Colin Smith has carved out his own niche as one of the bigger athletes on Darkside’s D-line. As for UNC’s rookies, Andrew Li has been particularly exciting to watch in his first season in Chapel Hill, transferring a lot of his skill as a handler on Triforce to the UNC D-line. His path on this team for the season as a whole could be one of the most interesting for any freshman competing in college this year. You could argue that the main question for UNC is how much they will actually be tested this early in the season. It’s happened in the past — see UNC’s Sunday Kickoff game against NC State last year — but that’s largely in their control, rather than their opponents’. #14 NC State Alpha and #15 UNC Wilmington Seamen are the Tar Heel state teams with the most to gain from this weekend. While Wilmington focuses on applying consistency in games with the concepts they’ve been practicing and getting reps for the 13 underclassmen on the roster, State will have a first taste of what their new team culture can deliver in the spring. State showed a promising level of efficiency on offense in the fall with senior Bailey Laberteaux acting as a solid anchor for their offense. Their D line also showed a good deal of poise on the turn and if Rhys Gretsch is at 100 percent this weekend he will be a treat to watch on State’s D line offense. Wilmington sits in a very interesting position as they gear up for the weekend. They have a great core of returners and a sizable class of younger players who all need more experience playing against high-quality teams. Last year, Wilmington didn’t really compete against any of the truly top squads that challenged their offense until Easterns. Wilmington has a system and all the players they need to make that system work. Connor Russell was the man on a lot of points for Patrol’s offense last year. Rick Hennighausen is probably one of the most unlikely players to go from being at the bottom of a college team’s roster to earning a spot on a U24 national team. When he’s taking shots strategically, Willie Stewart is the irreplaceable throwing cog that allows Wilmington to successfully attack deep; he will need to demonstrate a better level of decision making and execution this season. Consistency is the key piece that has been missing from this Wilmington team and you could argue that has always been what they’ve struggled with long before this roster. A rematch from regionals against Georgetown Catholic Justice is just one of several opportunities Wilmington will have to test themselves against interregional opponents. Georgetown, Clemson, Appalachian State, and Duke all come into the weekend as serious underdogs at this tournament. 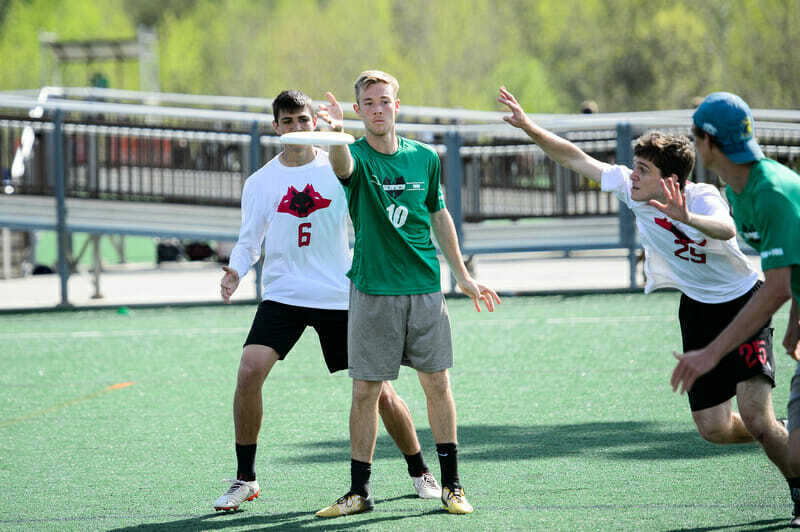 Georgetown lost a lot of the top-end talent that led them to nationals in 2018 and face a tough draw of teams, even beyond Wilmington. #18 Emory Juice has all the makings of a team ready to make a splash at Kickoff. They have a great crop of core players headlined by fifth year Anders Olsen. This was the very same core that earned a third bid for the southeast last year and they have all the reason in the world to play well this weekend. How deep Emory is outside of their core remains to be seen, but Juice could certainly make a run to the semis in Chapel Hill if they play well. Whereas last year Olsen and Daniel Sperling played together on Emory’s O-line, this year may see more defensive production out of Olsen as Emory begins to incorporate the talent of some younger players. Paideia products Matthew Shu and Will Johnson will be competing in their first spring college tournament on Emory’s offensive line, and there is a wealth of riches that the team can call upon when they play this weekend. Florida State DUF and Georgia Tech Tribe are true dark horses with opportunities to show what they can bring to bear later this season. Georgia Tech is still a relatively young squad but they showed some real flashes of potential, particularly with their defense. Tyler French was a largely unsung freshman last year, but he possesses tremendous athleticism and was a dangerous matchup for other teams close to Tech’s caliber last year. There’s no reason to suspect that Tribe will be pushover for Wilmington on Saturday morning. Florida State has lost some of the key pieces that drove them to Nationals last year, but the team has built up into a program that can compete to make Natties on an annual basis. We’ll see how their former role players do when the spotlight is on them this season. Ranked D-III squads #4 Carleton GoP and #6 Richmond Spidermonkeys have plenty to be excited about heading into Kickoff. The field overall may not be as deep as in years past, which will give both teams opportunities to get tested by D-I competition and try to nab wins. Most exciting of all, the teams will face off on Saturday morning. The winner of that game will be in a great position to lock up a quarterfinal berth Saturday afternoon. Carleton GoP got their great 2018 season off the ground at Kickoff last year when they notched a big win over Central Florida. The strength of GoP came from their offense, which was one of the best in the division last year at shifting the field and opening up chances in the break lane. The key handler from that squad, Abe Eichner, is graduated, and one of the big questions that GoP faces is who will take over that central role for the team. Saul Wildavsky headlines a strong cutting core for the team, but GoP needs to have a strong showing from their backfield if they wish to keep up on offense this weekend. Richmond had a very successful fall, beating a slate of regional caliber D-I teams including Virginia, William and Mary, and Georgetown. Chris Cassella and Chris Selwood reprise their roles as the main drivers behind Richmond’s offense. Richmond has a good shot at giving GoP a run and punishing D-I squads that aren’t prepared for the kind of ultimate the Spidermonkeys are capable of playing. They have the unenviable task of playing UNC to end pool play, but Richmond is not the kind of team to turn down a hard challenge. If they can play well and get key holds against Darkside, that could serve up a nice bump in their ranking early in the season. Comments on "Carolina Kickoff 2019: Tournament Preview (Men’s)"